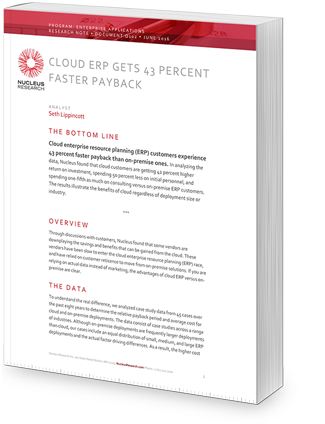 In “Cloud ERP Gets 43 Percent Faster Payback,” Nucleus Research examines the data from 45 case studies, done over eight years, to explode the myth that you’ll get a similar ROI from your ERP solution whether it’s on-premise or in the cloud. Nucleus analyst Seth Lippincott says, “Vendors that aren’t adopting a ‘cloud first’ strategy risk being left behind…” If you don’t want to be stranded with them, consider moving to cloud. Download and read this Nucleus paper today for more details!